From smoky dives to Carnegie Hall, from Amsterdam’s Concertgebouw to Cambridge’s folk Club Passim, Jim Guttmann has had a performance career spanning over 30 years and many musical idioms. He is a founding member of the Boston’s internationally acclaimed Klezmer Conservatory Band and, as a member of the band, has performed and recorded with Itzhak Perlman and Joel Grey. He has worked with nationally renowned entertainers and musicians, including the legendary Eartha Kitt, Mark Murphy, western swing legend Tiny Moore, blues masters Johnny Shines and James Cotton, the new acoustic music stars Matt Glaser and Russ Barenberg, the Boston version of Jaki Byard’s Apollo Stompers and the Artie Shaw Band. He performed with the Boston Philharmonic Orchestra for many years. He served as the musical director and bassist for the 1986 Tufts University Jazz Festival’s Soul to Soul: A Tribute to Aretha Franklin, and in 1999, premiered Gunther Schuller’s “Fantastical Colloquy” a duet for trumpet & contrabass. Along with clarinetist Richard Stolzman and violinist Dan Stepner, he was part of the Grammy Award winning ensemble on Yehudi Wyner’s “The Mirror”. As an educator, Jim has taught privately for almost 30 years, helping his students find their own voice on the bass, preparing them for successful Junior, Senior District and All State orchestra and jazz band auditions and sending many off to highly regarded college level programs. He has led and participated in educational programs on music in general, and jazz and klezmer music in particular throughout New England, in New York City, and around the USA. 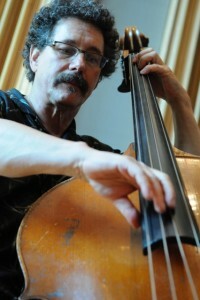 Jim has studied performance with Edwin Barker and Dave Holland, harmony with Richard Cornell and techniques for improvisation with Charlie Banacos. He is the recipient of a National Endowment for the Arts grant to study the arco solo tradition in jazz bass playing.